Dunedin’s Maryhill Extension line was the world’s steepest public tramline. At the turn of the 20th century, this cable car ride was a tourist magnet with people coming from all over the world to experience the thrilling ride. 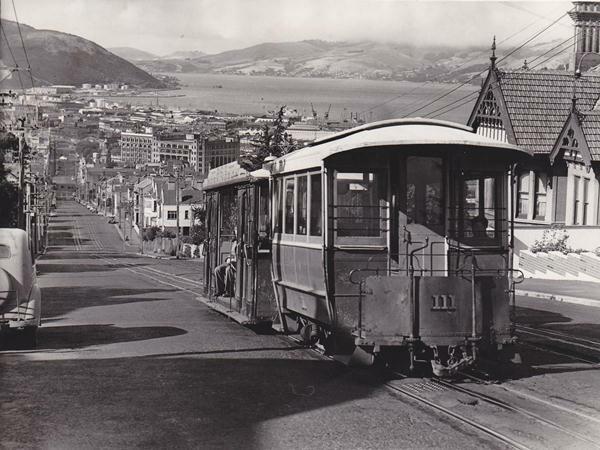 This year, the Light Rail Trust in Dunedin hopes to finalize plans to re-establish the Mornington cable car up High Street. Opened in 1881, this line closed in October 1957. I remember as a small boy being taken by my father to witness the last cable car (also called a tram) make the trip to the Mornington terminus. I didn’t understand all the fuss at the time but can now appreciate what a mistake it was to close this last of 4 cableways that once made Dunedin the envy of other southern hemisphere cities. Even in the 1950s, the Roslyn line was drawing tourists who wanted to experience this unique mode of public transport, especially on the steep inclines that made Dunedin’s network so exciting. It is amazing that the local council was so short sighted and ordered the closure of all the city’s cableways. As the years go by, the little trams would have only gained more popularity as is evident with the world’s last remaining system in San Francisco. With the closure of Dunedin’s last cable car line, the San Francisco Municipal Railway became the sole operator of a cable car service in the world. When you think of San Francisco, I bet the cable car is one of the first attractions that come to mind. When I visited the city, I knew I had to take a ride on the iconic little conveyances which have been sung about in musicals and appeared in countless movies. In 2016, San Francisco welcomed 25.1 million tourists who spent 9.69 billion dollars in the city. I’d suggest the cable car ride was one of the attractions most of these visitors spent money on. 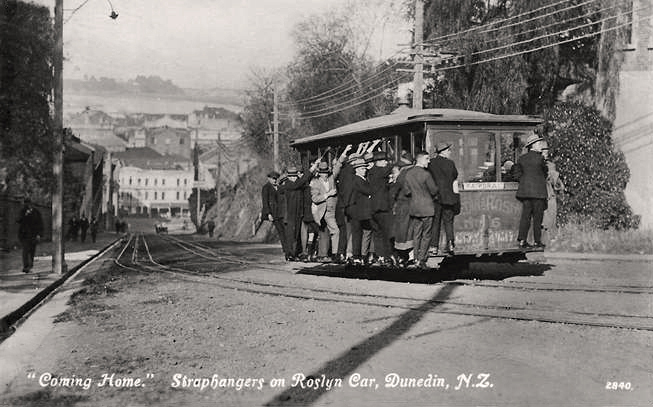 With the opening of the Roslyn line in 1881, Dunedin was the first city outside the United States to operate a cable car system. Weighing 32 tons, the huge 28 foot diameter wheel in the Roslyn power house turned the wire rope that drove the cars on the line and was the largest wheel in the southern hemisphere. Reading about Dunedin’s cable car system leaves you stunned at the 19th century engineering feat it was. With cables continually moving underground, maintenance was a major undertaking. Controlling the cars by using a gripper to grab the moving cable was a specialist job and the gripman was a well respected member of the community. These men became well known and would often wait for passengers if they were running a little late. It was also a cold job during Dunedin’s brisk winters as the cars were open sided and there was always a draft blowing across them. There is a story of a conductor who placed a pram on the hooks that lined the front and back of the vehicles. On one occasion, he was shocked when he removed the pram after a trip down High Street to discover the mother had left her baby inside the pram!! After that, conductors were warned about this particular mother and always double checked her pram before slinging it onto the cable car. Occasionally school boys would lie in wait at curves in the track and as a cable car approached, they would run and place a rock on the rails. This would usually de-rail the tram and it would take a great amount of effort to get it back onto the track, not to mention the disruption to passengers and the running of other trams. Today the boys would be hauled before the Youth Court for endangering lives but back then, they would only run the risk of losing a week’s pocket money. It is not only the longevity of Dunedin’s cable cars that made them important, but also the system’s technological advances. Faced with a 13% grade that made it too heavy for a let-go curve George Smith Duncan, a prominent supporter of the Dunedin system invented the pull curve allowing the cable car to negotiate a curve without letting go of the cable. This system was later adopted in San Francisco. 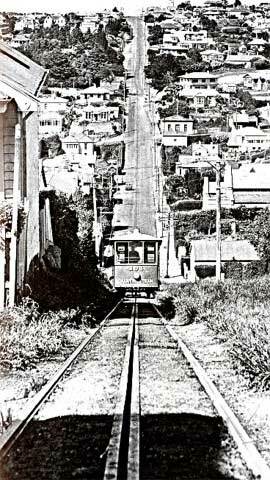 There were 4 cable car routes on the city’s hills with Mornington being the last to close. This line also had the Maryhill Extension line which was the world’s steepest public tramline. Why it was closed is a mystery as tourists had already discovered it and made it a ‘must’ while visiting Dunedin. Local kids would gather at the start of the line and laugh and cheer when they heard the shrieks from passengers as the car plunged over the precipitous edge and rattled down the 1: 3.5 gradient. I can remember my grandmother telling me how scary the ride was especially on the downward journey. The passengers sitting shoulder to shoulder on each open side of the car would slide onto each other with the person sitting closest to the front being squashed by the others due to the steep angle they were on. Today, it would be unthinkable to put the public at such a risk. The cableway route was too steep for buses or cars so the cable car was the only means of transport from Mornington village to the upmarket suburb of Maryhill. The area could be reached by car along Highgate, but the cable car offered a more direct route from the centre of the city. A Dunedin cable car is on exhibit at museums in Auckland and Christchurch as well as in an American museum. 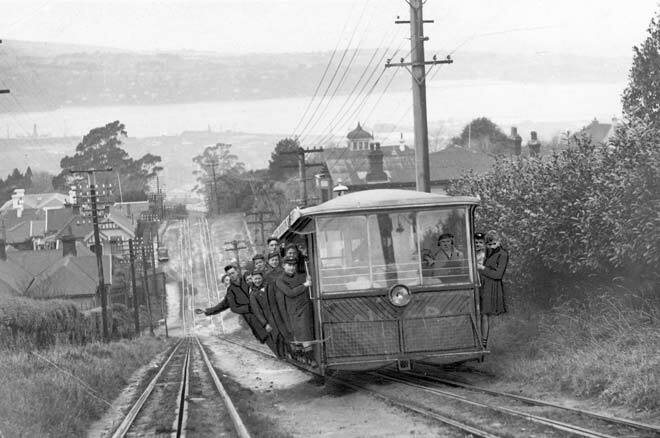 With the new government saying they want to invest in the regions, maybe they can put money where their mouth is and throw some to the Dunedin Heritage Light Rail Trust who want to re-open the Mornington cable car route. It would again be the only cable car system outside San Francisco and with tourism booming in New Zealand it is a perfect time to get the cable running again under High Street. To make the trip worthwhile, why not open a Victorian tearoom at the top of the line. Tea houses are becoming popular overseas and Dunedin once had a selection of the best tearooms in the colony.